This beautiful Serta Upholstery Momentum Magenta with a rich solid wood-front combination of colors and fabrics will bring warmth to any home. Arms covered in a choice of rich material and the cushions and seat pillows in a contrasting floral pattern fabric. 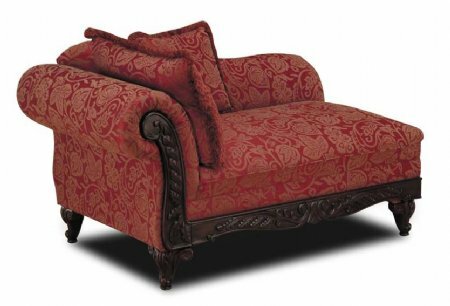 Set also features dark cherry wood trim that continues around the base and the decorative carved feet. It features Chaise Lounge, two large loose pillow backs. This suite embodies luxury for a fraction of the cost. Features: Hardwood lumber in all stress points or load-bearing areas of frames Backs and pillows are air-blown with polyurethane foam or polyester fiber to contour the body for maximum support and comfort Springs are machine tested for durability and lasting support Sturdy frame provides an anchor for good seating support Committed to manufacturing quality in each step on their manufacturing process Formaldehyde free Made in the USA Legs must be attached 1 Year warranty Other Items from this Collection: Chaise Lounge for $459 3 pc. Table set for $369 Sofa and Loveseat available upon request. Guaranteed Lowest Prices! Click on thumbnail to view image.